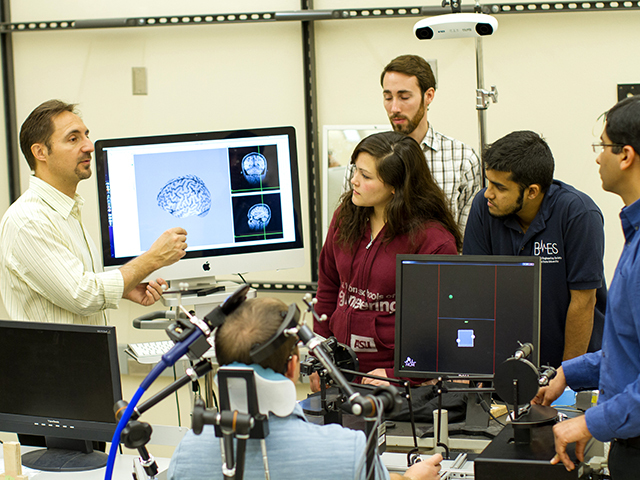 Arizona State University engineering student Kaleia Krämer (center) works in ASU’s Neural Control of Movement Laboratory, directed by professor Marco Santello (at left). What Krämer has been learning in the lab about the processes underlying human movement helped earn her a Flinn Scholar Intern position in bioscience and bioengineering research. 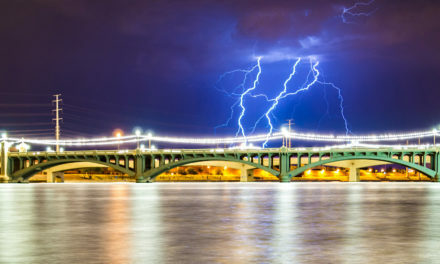 Photography by Jessica Hochreiter/ASU. Kaleia Krämer spent the summer before her junior year at Arizona State University as a Flinn Scholar Intern, giving her an exceptional opportunity to broaden her experience in biomedical research. The biomedical engineering major worked this summer at the Arizona Center on Aging and the Interdisciplinary Consortium on Advanced Motion Performance, both based at the University of Arizona. Krämer built on what she is learning at ASU, where she has been involved in research since her first semester as a freshman. She decided to study in ASU’s Ira A. Fulton Schools of Engineering because of her interest in neuroscience and the engineering schools’ commitment to providing research opportunities to undergraduates. She has been assisting in the Neural Control of Movement Laboratory, directed by professor Marco Santello, a neuroscientist and the director of the School of Biological and Health Systems Engineering, one of the Fulton Schools of Engineering. What she at first found most interesting was the study of the planning and execution of movement using a Transcranial Magnetic Stimulation machine. The technology enables researchers to selectively inhibit areas of the brain to infer the roles of specific areas in the planning and execution of movement. As she spent more time in the lab and attended several research conferences, Krämer says her interest swung toward studying Alzheimer’s disease, leading her to seek the Flinn Scholars Research Internship. The Flinn Foundation, which supports the advancement of the biosciences in Arizona, selects students for its internship program based on their interest in studying the impacts of aging, and on the potential internship candidates show for making contributions to research in the area. The internship award provided a stipend to cover some expenses and opportunities to make presentations about her work at the annual conference of the Arizona Aging and Cognition Collaborative and at other national gatherings of researchers. 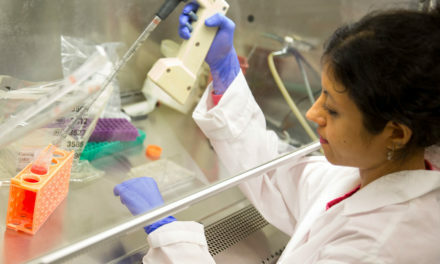 Krämer said her research under the supervision of Santello and biomedical engineering postdoctoral fellow Pranav Parikh has given her a strong understanding of the neural processes underlying the control of human movement, and her internship assignments gave her a better understanding of cognitive processes involved in movement control. Among her internship tasks related to research on aging and movement control, she helped explore new ways to enable and encourage patients to perform effective physical therapy in their homes – both for rehabilitation purposes and to prevent diminishing function due to aging. Her project focused on validating the effectiveness of Kinect – a line of motion-sensing devices designed for video games – compared to clinical motion tracking using wearable sensors. She looked at the ability of Kinect technology to create a virtual environment for rehabilitation via virtual-reality games such as Tai Chi. With the knowledge she acquired through her summer internship research project, along with what she is learning in Santello’s lab, Krämer said she hopes to design a follow-up research project to carry out during her remaining undergraduate years at ASU. Beyond her research and studies, Krämer is involved at ASU in the Engineering Projects in Community Service (EPICS) program, which enables students to put their engineering skills to work outside the classroom to aid nonprofit organizations, municipalities and social entrepreneurship ventures. She is project leader for the EPICS team Nonquistadora, whose mission is to design and develop a bio-digesting latrine, water filtration and purification system, and an aquaponics system capable of converting waste into food and water, for communities in West Africa. Krämer has also been admitted to ASU’s Fulton Grand Challenge Scholars Program, which focuses on an interdisciplinary and globally oriented course of study and experiential learning designed to prepare students to be leaders in endeavors to solve society’s most critical technological and engineering challenges. Outside of studies and research, Krämer – who is also pursuing a minor in dance – is a counselor and a member of the student committee for E2 Camp, the Fulton Schools of Engineering freshman introductory experience. She is also a co-founder of an ASU chapter of Shannon’s After-School Reading Exchange (SHARE), a nonprofit organization supporting education for girls in Africa.